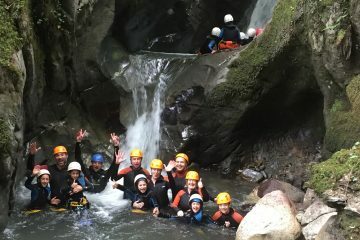 Our summer multi activity holidays in the French Pyrenees are understandably popular with families with active and adventurous children and groups of friends. You get to choose from a whole range of land and water based activities from which we create your very own personalised itinerary. Choose a tailor made multi activity holiday if you just want to do it all on your summer holiday. Ever fancied river canyoning? Older kids love the challenge and groups of mates have a blast jumping from several metres up into deep pools of chilly water! You can go rock climbing, experience fun high ropes adventures, enjoy the fast currents on a river rafting experience or even go paragliding. Think of an activity and chances are you can do it on our sumer multi activity adventure holiday in the stunning Pyrenees mountains in SW France. You not only have a choice of activities on our tailor made summer adventure holidays but a choice of accommodation too. Choose from a wide range of accommodation for all budgets and then sit back and let The Adventure Creators create your ideal summer multi activity adventure holiday. It’s what we’re good at, after all.